The Musings of a NSW modeler...: Time?! Time is a thing that seems to be eluding me at the moment, after a dramatic taper in work towards the end of last year, 2013 has brought with it new projects, some work starting to come in for customers and trying to catch up on my own bits and pieces. I will always take on more modelling work ie: kit building/repaints/decaling/weathering etc from customers, it is then just a matter of squeezing everything else around that. 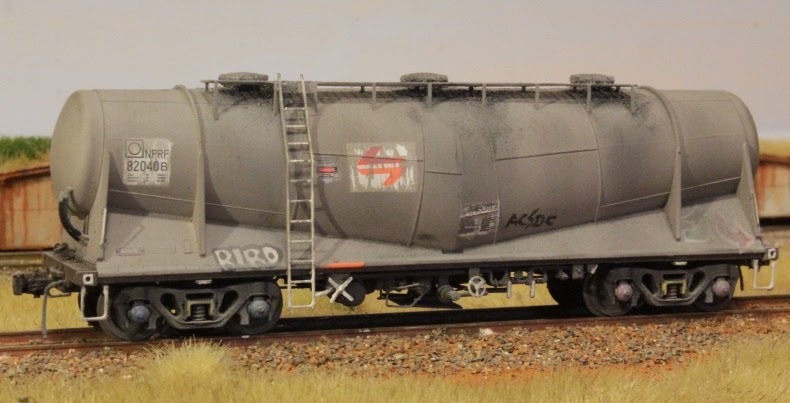 After the purchase of a couple of Austrains 80 Class locos for myself I have embarked on the job of super detailing and weathering, firstly 8003 (tuscan) is coping the whole treatment , replacement Pilots, staff exchangers, air hoses, horns, air reservoir, fuel and air line piping, brake cylinders, bogie steps and sander piping, cab interior detailing, mirrors, MU cables, and what ever else i have forgotten, then some weathering and will be put on the roster. The next in line will be 8027 (in reverse) which i will document step by step for all to see! Apart from all that, those of you who have viewed my other blog project7andaquarter.blogspot.com will know i have embarked on another project, the design, construction and operation of a 7.25 inch gauge 'freelanced' locomotive. Although in the early stages, it is occupying a reasonable amount of my brain space as the idea of actually driving something that me and my engineering buddy have designed and built ourselves is quite exciting!!! And as always please feel free to comment on either blog as every ones thoughts are always welcomed! it helps me to know where im going right (or wrong for that matter) and allows others to inspire me to do different and sometimes better things! Thank you all for taking the time to read my gibberish Ha ha!!! Hey Kyle, Just a note reading this latest blog, 8027 was never Reverse. Just though to give you a heads up there in case you have started. Cheers for that, i did mean 8047 just a slip of the finger ha ha. Thank you for your comments.